The low trellis hop growing system, which is more cost effective and the future of hop growing, was developed in the United Kingdom, and is being emulated in the rest of the world. The British hop harvest is dramatic, noisy, frenetic and does not last very long. In just a few weeks British hop farms will have completed the harvest of one of its oldest, most romantic, most fabulously aromatic British crops. 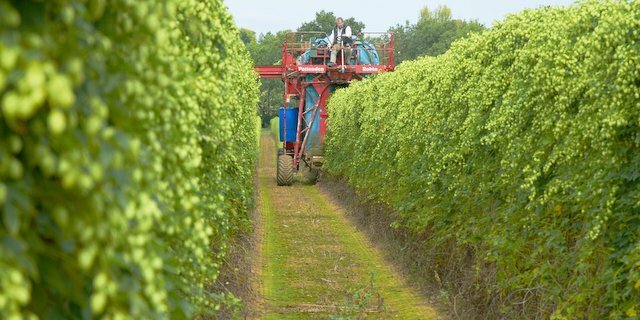 British hops are grown in Herefordshire and Worcestershire and in Kent, Surrey, Sussex and Hampshire. During harvest the whole hop bines are taken out of the hop yards to a “picking” machine which strips the hop bine, separates the hop from the leaf and conveys the hops into the kilns where they are dried before being conditioned and baled. September is the month when the hop growing year culminates: from stringing the hop yard in March, training the hop plant in April, through the summer months of pest and disease protection, to ensuring that the hops are ready to harvest in September. It’s an old process: British hops have been grown by farmers for over 500 years and were harvested by hand until the 1960s. Since then the process has been mechanized. It’s a romantic process full of wonderful hop aromas: orange, lemon, spice, mint, grass, molasses, blackcurrant, tangerine, summer fruits, pear, summer flowers, apricot and black pepper. It’s noisy, dramatic and unforgettable. What’s so special about British Hops? It’s all about our unique terroir and low myrcene: Craft brewers often rave about new world American and New Zealand hops, but American and New Zealand craft brewers are starting to rave about British hops. These overseas brewers are now seeking delicate, complex hop aromas to create drinkable session beers. And it is the unique terroir of British hops with lower levels of myrcene that makes British hops the perfect hop to brew a drinkable session beer. There are over 20 commercially grown British aroma hop varieties in the UK. 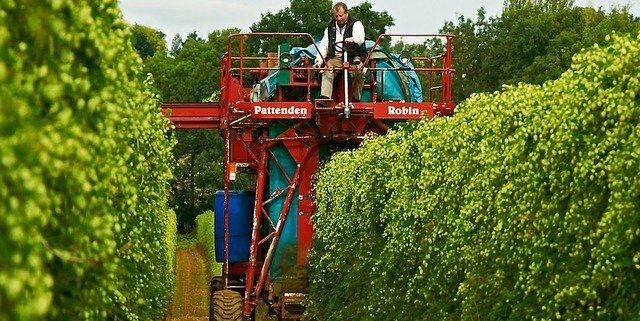 British hops have a world leading hop breeding program. *Terroir: The factors that affect terroir are the soil, geography, geology, topography and climate. The term is derived from the French “terre” meaning “land” and the concept of terroir has come from the French wine industry. @CraftBrewingBiz wow, thanks. Really appreciate your support. Mi Craft Beer Culture liked this on Facebook.